It hasn't taken players very long to reach Anthem's final mission, some less than others. 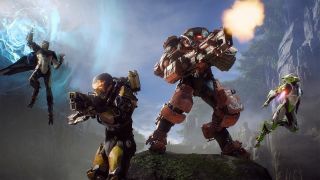 A quickplay bug is reportedly sending low level players into Anthem's climactic battle, just a wee bit underprepared. When you're in Anthem's unintuitive mission select screen, selecting quickplay is meant to send you into an appropriate group that needs an additional player. In some cases, however, it seems to be ignoring level restrictions and is hurling players right into the last mission of the game. Streamer Brandon Larned captured the moment when a level 3 player appeared. Give it a watch below. You can't see the player's level in the clip, but you can hear the new arrival saying that he hasn't played the story mission yet. On Twitter, Larned notes that while this player did leave the mission, another player, this time level 2, did not. Quickplay might also be messing with the level indicator. On Reddit, another player writes that their friend, level 16, was showing up as level 9. That doesn't seem to be what's happening in the clip above, however, as the quickplay player is clearly surprised to be there. It might be worth avoiding quickplay until this is fixed. Lead producer Ben Irving confirmed the bug's existence on Twitter, so hopefully it will be sorted out soon. Steven is working away on our Anthem review in progress, and so far he's not been very impressed. If you can't tell, I'm not enjoying my time with Anthem. The combo system is a clever innovation that rewards teamwork and aggressive but smart use of my javelin's abilities, but that's about the only worthwhile thing I like about Anthem aside from it being gorgeous. I prefer my BioWare games to be ugly on the outside and beautiful on the inside. Check back for our full review later. Anthem is available now for Origin Premier members, and everyone else can get their hands on it come February 22.